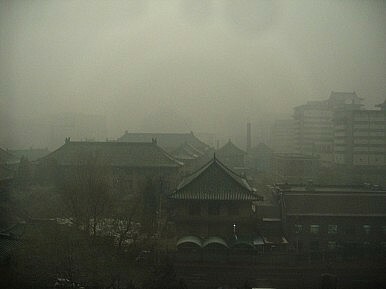 Smog recently forced the cancellation of hundreds of Beijing flights. Locals’ patience over pollution is wearing thin. Smog recently forced the cancellation of almost 700 flights at Beijing airport, igniting a mini media firestorm. Since flights at Beijing’s airport have been canceled on any number of occasions over the past two decades because of pollution, why all the attention now? First, the flight cancellations have generally occurred in the spring as a result of the yellow dust storms that sweep across China’s northern plain. The city of Beijing has little ability to control these choking clouds of dust. This time, however, the pollution was all Beijing’s doing. Second, the Beijing government is already under enormous popular pressure for its inability and/or unwillingness to tackle its air quality problems head on. Everyone in Beijing knows that on a daily basis the air quality ranges from fair to fairly awful. How else did it earn the distinction of being one of the world’s dirtiest capitals? But the local government simply refuses to acknowledge the reality of the problem. Thus, while it regularly reports blue sky days, the people in Beijing live in an almost perpetual state of gray. Beijing has pledged to report on additional pollutants by 2016. Why 2016? My guess is that they are waiting for the 12th Five Year Plan to kick into gear in the vain hope that the government’s investment in alternative energies and alternative fuel vehicles will come to fruition and help them out. I don’t think the people will wait that long. They know that the government has the capacity to measure and report on the additional statistics now. Real estate billionaire Pan Shiyi conducted an online poll and discovered that 91 percent of the more than 40,000 respondents believed that the government should monitor particle levels at the 2.5 micrometer level this year – people in Beijing care about their health and the health of their children. According to a deputy director of the Beijing Health Bureau, the lung cancer rate in Beijing over the past decade has increased by 60 percent, even though the rate of smoking hasn’t increased. It doesn’t help the Beijing public to know that their own leaders have air purifiers in their offices and other government buildings. Even as Beijing struggles to address the popular discontent with the city’s air pollution, it appears to be trying to get ahead of the curve on water issues. The Global Times announced that people in Beijing will be able to access daily an online system to check their water quality. Of course, they will be receiving information not about the water they drink, but rather about the quality of the water at the pumping station. As the article also notes, what happens as the water travels through “broken pipes” and “aging storage tanks” is anybody’s guess. Beijing has opened its air pollution monitoring center to individual members of the public for the first time.